That’s why I thought I’d take a moment here to explain what Constitutional Carry is and why we need it here in Minnesota! It’s also important to note that Constitutional Carry deals specifically with removing the requirement of a permit to carry a firearm, not the locations where a firearm may be carried. We’re adamantly opposed to “gun-free zones” and want them to be completely gutted and repealed — but we’ll be addressing that issue in separate legislation. Of course, the very idea of Minnesota becoming a Constitutional Carry state makes gun-grabbers seethe with rage! 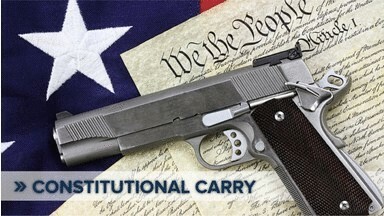 What’s more, Constitutional Carry is current law in ELEVEN states! It’s on the move in the legislatures of Utah, North Dakota, Ohio, Wisconsin, Iowa, Indiana, Michigan, Pennsylvania, Virginia, North Carolina, Georgia, Alabama and Texas! And that’s AFTER it passed West Virginia, Idaho, Mississippi and the state of Missouri just last year! And of course, there has never been a better political environment in which to make this happen in Minnesota — after gun owners gave Rod Skoe, Lyle Koenen and more the boot in the Nov. 8 elections! The Minnesota Senate leadership ‘bet the farm’ when they thought they could vote against Constitutional Carry in 2015 and not pay a price. Please do your part, by signing your petition in support of this legislation right away! As you may know, Representative Cal Bahr has already introduced our Constitutional Carry bill (HF309), and we’re going to need YOUR help to pass it through the legislature! So please sign your petition in support of Constitutional Carry right away! After that, please share this email with your friends and family. And if you can, please consider your most generous contribution of $250, $100, $50 or $20 help us activate and mobilize gun owners across the state to join us in our battle to pass this critical pro-gun reform! P.S. Once passed, the Minnesota Constitutional Carry Bill (HF309) would restore the right of every law-abiding citizen to carry a firearm to protect themselves and their families — WITHOUT having to add their name to a government database! Constitutional Carry is on the march all over the country, and I believe we can make it a reality here in Minnesota as well — now that gun owners booted out anti-gun State Senators like Rod Skoe and Lyle Koenen!